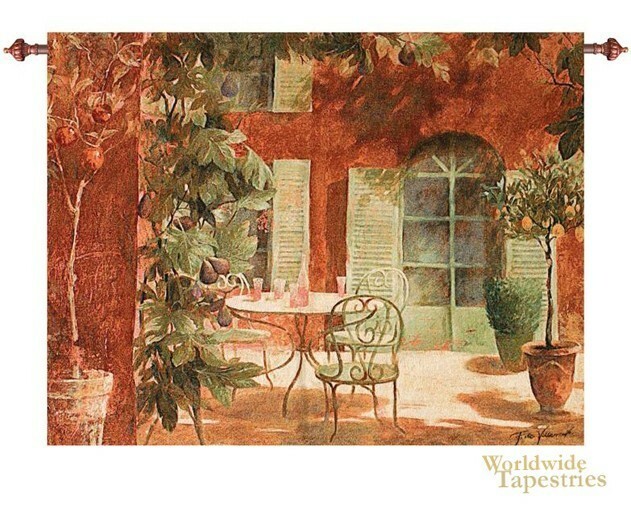 This tapestry “Rendezvous Provencial” shows a delightful garden courtyard in France. Here we see a lovely scene of potted plants and French windows where a table setting is placed to enjoy the glorious day. A place for a rendezvous, this scene is bathed in a beautiful light, which shows the feeling of lightness and beauty of this scene. The fruit trees of apples and oranges as well as passionfruit ties the scene together providing green foliage which matches the potted plants an windows well, and provides colored fruit which adds subtle reds, purples and oranges to the scene. This tapestry “Rendezvous Provencial” is lined and has a tunnel for easy hanging. Note: tapestry rods and tassels, where pictured, are not included in the price.